There was BIG NEWS Monday about the IARC and World Health Organization’s report about red and processed meat causing cancer. It wasn’t the most shocking news, as we’ve be warned for years that eating red and processed meat could lead to future health issues. In other words, uh-duh! Still, seeing the bold headlines was a little upsetting, especially since I had bacon with my Sunday brunch. But meat lovers, don’t despair! While a simple glance at a headline may initially convince you that your next BLT is going to give you cancer, a little further reading clears up the finer points of this study. True, these types of studies are meant to tell us if something causes cancer, but they don’t describe how potent they are as cancer causing agents. Here’s a handy info graphic to give you some perspective on cause vs. risk. So yes, a steady diet of red meat and sausage will probably damage your health, however you can still enjoy these foods in moderate amounts and be fine. 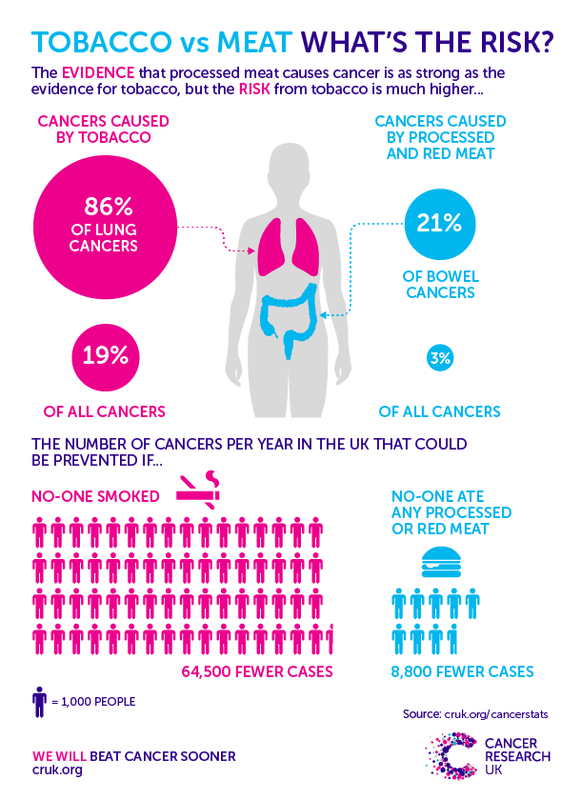 For more information, this article from Cancer Research UK explains it further. So, what will become of the Paleo diet if we can’t eat bacon and grass-fed beef with abandon? The modern cavemen are already firing back. One of their arguments is that the WHO didn’t test grass-fed beef vs. “MacDonald’s beef”. Unfortunately for them, the evidence shows that it’s the naturally occurring chemicals in meat and how our bodies process them that increase the risk of cancer. This is not to say that the quality of our protein doesn’t matter. It’s in relation to this bowel cancer study that the grass-fed beef vs. corn-fed beef difference is irrelevant. What do you think of the WHO findings? Will this change how you eat at all? Or are you in the “Oh, well, everything causes cancer” camp? Let me know on Facebook @blitzyourbody!